I bought the winter honeysuckle a few years ago, tied it to the fence trellis so it would grow up rather than spread out and I have to say that it is a delight. Mine starts to flower in October with the majority coming out in Nov/Dec and lasting until March. The Bumble bees are on it every day, even when we are in very low temperatures during the winter. It is a must for anyone who loves to plant for our pollinators and smells lovely. 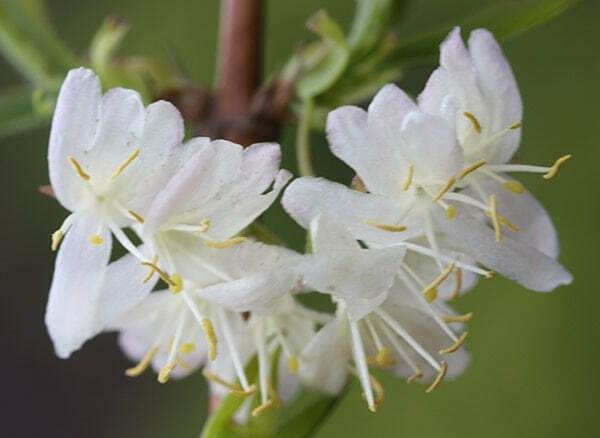 Slow to grow in first year against south facing fence, very fragrant small creamy white flowers late winter early spring, masses of attractive new foliage now and growing well. I planted four along a low East facing wall in between birches and underplanted them with box balls. It was a very difficult area and one of the birches and a few other shrubs simply gave up and died. This lot are thriving. Since planting them three years ago I did absolutely nothing apart from the usual Spring feed. The growth wasn't slow in the first year but it was just the central shoot going upwards. There were a few flowers in the second year and although dainty each one had an early bumble visiting. The scent is stronger on a sunny day but not overpowering. Now that they have filled out sideways they have formed a light screen allowing the sunlight to filter through. The wonderful light green of the leaves works beautifully with white birches, dark box and red dogwood stems. Mine are likely to exceed the usual height as I find everything grown on clay tends to. Currently unsure of it's merit. Arrived (back in October) very small and with not much growth, so this was initially disappointing, however over the last couple of months, after planting it in the ground (was previously in patio pot), it has really began to liven up, with lush growth really shooting up. Maybe it doesn't preform too well in a pot or maybe I didn't give it enough time before judging, but it is really coming along now. Will be interesting to see if it flowers this year as the flowers themselves apparently look stunning. This has really takenoff, growing abour 4 ft. in the year. I like this plant, but did not realise that the flowers were so small. Beautiful white flowers though not as much fragrance as the other honeysuckles in the garden. Hello, please may I ask whether this honeysuckle may be prone to harbour midges or blackfly - I have found this to be the case with climbing honeysuckles, which is ok as long as you don't disturb the leaves! However, I was rather hoping to find one to put by the door, and this winter flowering one looks so lovely, offering rare scent at this time, but wouldn't really want to be showered with insects every time I walk by ... Any advice much appreciated! Hello, This wont be immune to blackfly, however it is likely to harbour fewer than the climbing, summer flowering honeysuckles. 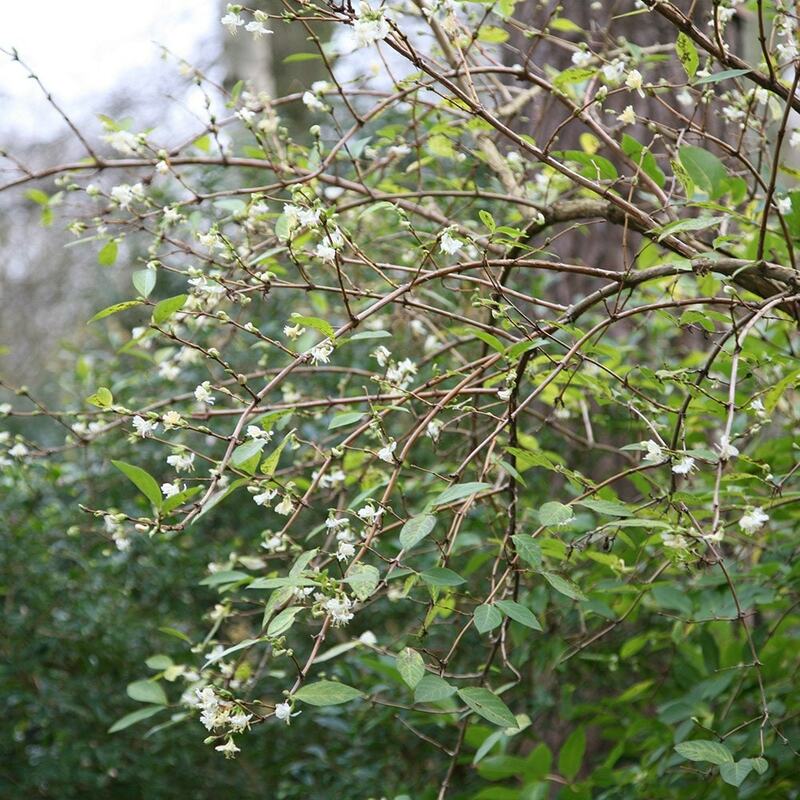 Can I grow Lonicera Winter Beauty successfully in a container ? I planted my lonicera purpusii this Spring but the leaves have started to turn brown. Is it dying or is there a deficiency? Hello, It's difficult to say what could b causing this without actually seeing the plant. The most likely cause is a lack of water, so do make sure the plant gets long and regular drinks. It is also quite normal for the leaves of deciduous plants like this one to start looking rather tatty towards the end of summer. Unless the browning is really widespread though, I would not be too concerned. My winter honeysuckle has flowered beautifully every year, despite spending it's first few years in a large container. It has been in the ground for two years now and has lots of healthy growth however it did not flower this year. I live in N.E Scotland and it usually flowers end of February/March. We did have a long winter followed by a very hot late spring. Daffodils were blooming late may into June. Do you think the weather was the reason or do I need to feed it?